DS1620 High Resolution Temperature Reading. 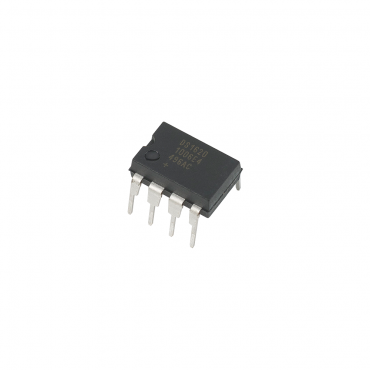 The DS1620 is a complete digital thermometer on a chip, capable of replacing the normal combination of temperature sensor and analog-to-digital converter in most applications. The DS1620 can also operate as a standalone thermostat. A temporary connection to a controller establishes the mode of operation and high/low-temperature set points. After which the chip independently controls three outputs: T (high), which goes active at temperatures above the high-temperature set point; T (low), active at temperatures below the set point; and T (com), which goes active at temperatures above the high set point, and stays active until the temperature drops below the low set point. Measures in units of 0.5° Centigrade (C) from -55° C to +125° C. (In Fahrenheit (°F), units of 0.9° F and a range of -67° F to +257° F.
Measures temperature within +/- 0.5°C error. Converts temperature to digital word in 750 ms.
Interfaces with any Parallax microcontroller. Current requirements: 1 mA (max), 1.5 uA (standby). Communication: 3-wire synchronous serial (SPI). Operating temp range: -67 to +257 °F (-55 to +125 °C).